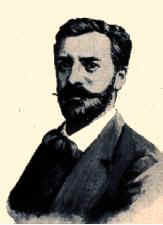 Bartholdi (1834-1904) was born in Colmar in Alsace, France. He received training there and in Paris as an architect. He also studied painting in Paris, and in 1855 he traveled to the Middle East to continue his studies. However, Bartholdi was soon devoting his energy to sculpture. His main interest was monumental sculpture, particularly large-scale pieces of heroic accomplishments, personalities, and events. While the Statue of Liberty is his best known work, his masterpiece is the "Lion of Belfort" (completed 1880), which is carved out of the red sandstone of a hill that towers over the city of Belfort in eastern France and is one of a number of patriotic sculptures by Bartholdi that were inspired by the French defeat in the Franco-German War of 1870-71. On February 18, 1879, the French sculptor Frédéric-Auguste Bartholdi (1834-1904) earned US Patent #11,023 for a "Design for a Statue." This statue, "Liberty Enlightening the World," would become one of the most famous monuments of world history. At a dinner party in 1865, Bartholdi and his host, historian Edouard-René de Laboulaye, had conceived the idea of France giving the US a monument for its Centennial of 1876. Many people believed Charlotte Bartholdi, the sculptor's mother was the model for the statue (see for yourself).